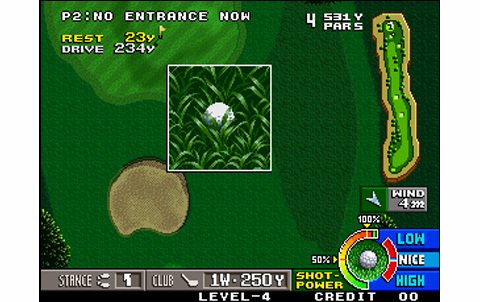 If there's a blessed millesim for the Neo Geo, it's undoubtlessly 1996. It's even hard to count how many good games were released on this wonderful year! 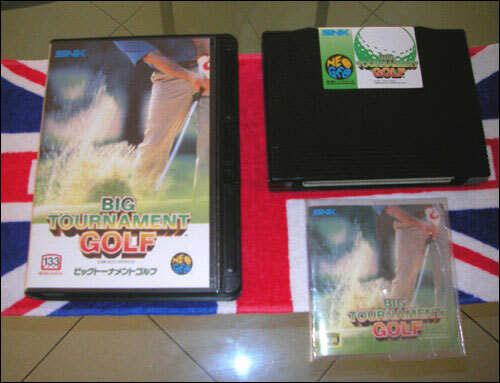 Metal Slug, The King of Fighters 96, Ninja Masters, Samurai Shodown IV, Real Bout, Waku Waku 7, Ultimate Eleven... and Neo Turf Masters, aka Big Tournament Golf. Not simply another golf game... an incredible one, maybe the best golf game ever made for the arcades. It's the Nazca development team who was put on this project. Its members were the ancient employees of Irem Corporation, a prestigious company which was famous during the eighties and the nineties in the videogame industry (R-Type, X-Multiply, Hammerin' Harry, In the Hunt, Undercover Cops, Bomberman ...). 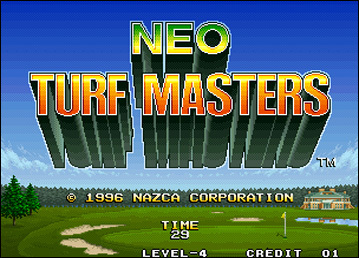 And if Metal Slug is probably the most famous hit made by Nazca for SNK, aficionados won't be disappointed with Neo Turf Masters, an amazing golf simulation for the Neo Geo. 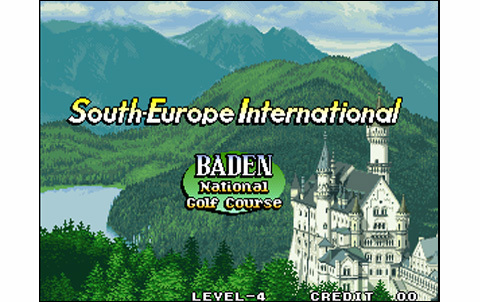 Six talented golfers are initially available, with their own qualities and defects among five parameters: power, accuracy, skill, recovery, putting competences. 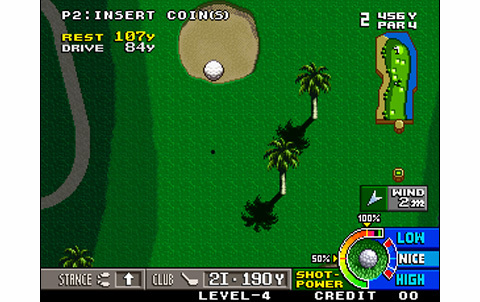 Then, choose who will fit best your style: a putt master who offers unequaled precision on greens, an overpowered hitter that can cover more than three-hundred yards in one shot, an all-around player, a technician who can come accross difficult parts, an old veteran who can manage difficult shots in deep rough or sand traps, and a strong and precise player. Once your golfer is chosen, four exotic golf courses with eighteen holes each are proposed. A very technical japanese course, long beaches and sun in Australia, deep forests and wavy grounds of the Baviere in Deutschland, or giant falls in the Grand Canyon, USA. 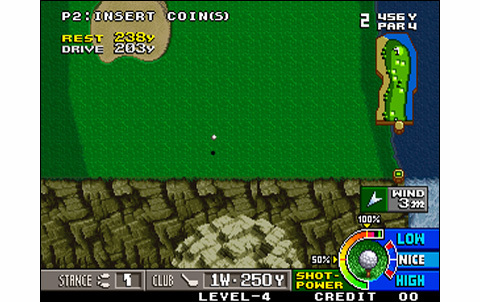 A single player can compete on full courses, playing against dozens of competitors controlled by the CPU. 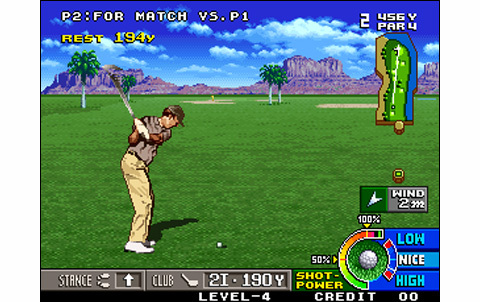 Two players can compete in a Match Play Championship or against other opponents (Stroke Play). 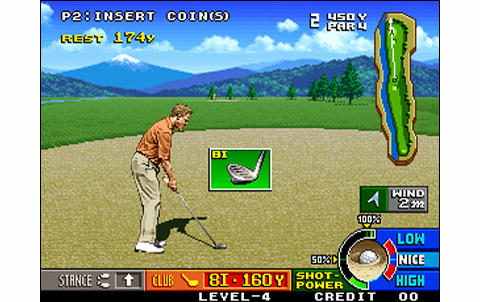 The game is punctuated by Longest Drive Contest and Closest to the Pin Contest. 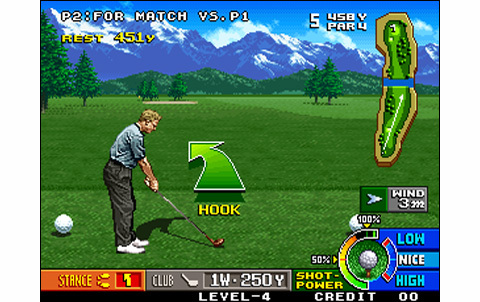 The controls of the game are particularly ergonomic, so much you almost won't need long explanations nor to read the notice, but they're furthermore fully comprhensive: spin effects (retro or top), side effects, height of strike, power meter, club selection... It's full, one could not have expected much better! 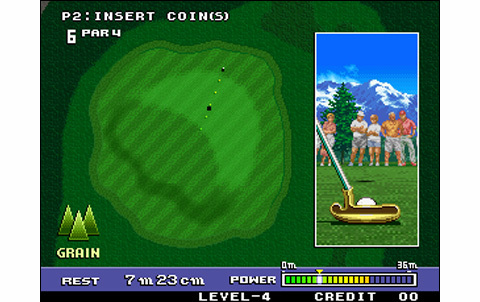 These commands allow you to play various styles of golf, which is very enjoyable and will have you spend pretty much time on NTM. 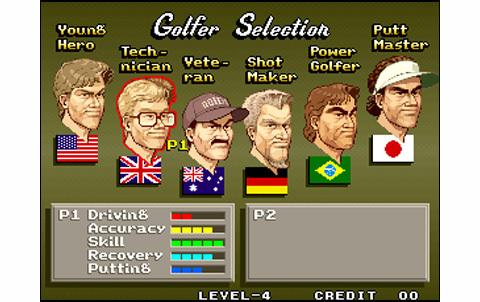 Moreover, the players are very different and make the game even more complete in golfing styles: some are powerful, other ones have a lot of technique... 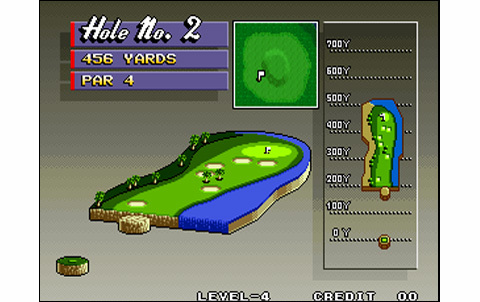 The four courses can be played pretty differently depending on the golfer you have picked. Moreover, these golfs are beautiful, the grass is green (incredible, huh?) and the difficulty is increasing during the events, just as it should. The graphics, made of pre-calculated 3D and 2D, are looking very good. The landscapes provide a good sensation of relief, fairway and green look good enough to have you want to roll over... ahem. One of the most remarkable feature is the animation: it's simply awesome. 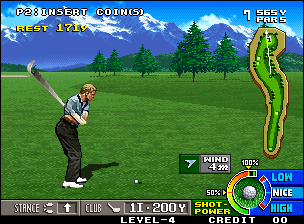 The decomposition of golfer's moves is almost perfect, featuring an important number of animation steps. 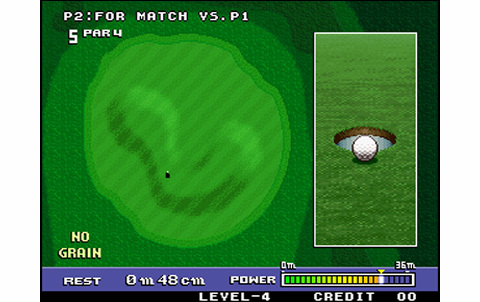 It's a model of smoothness, like all things moving in this game: scrollings, zooms in & out, effects on the ball, water... The sound effects are also very adequate and stick perfectly to this idyllic picture. 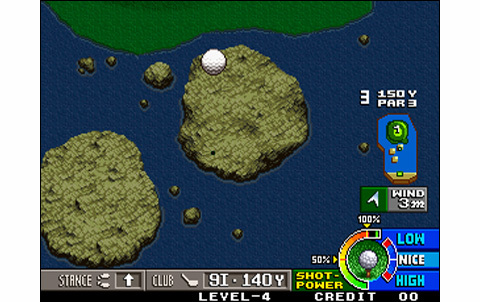 The melodies, four in total, sound a bit repetitive, but fit well with a golf game (sounds like a jazzy elevator...). 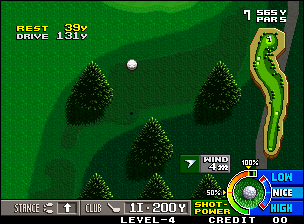 If the game is absolutely awesome when playing two, the single player mode still offers four nice challenges. 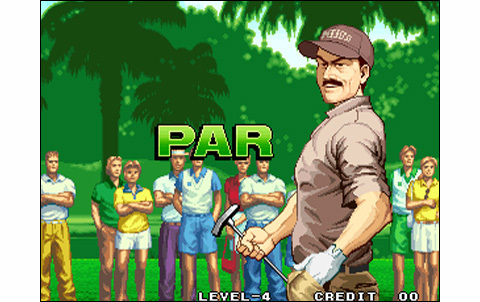 The game is so well done and the gameplay so well thought out that it's a pleasure to hit the balls and progress along the holes, and be sure you'll want to get back to it regularly. 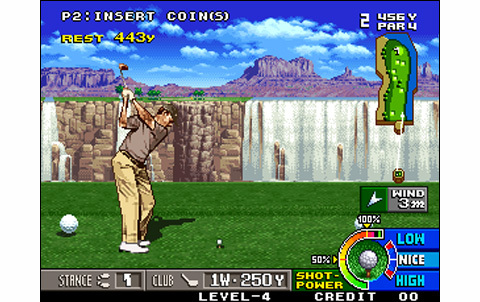 If you love golf, simply run to Neo Turf Masters, an arcade-style golf game offering controls quite close to a real simulation. 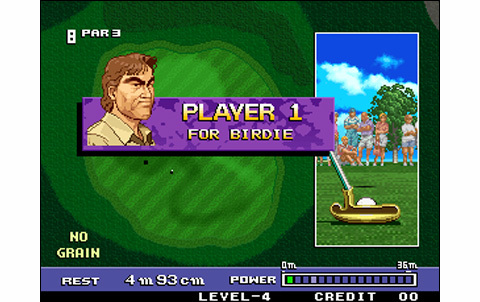 If you don't like videogames of golf, then it's a shame, because you're missing an exceptional piece of gaming. Excellent, from the intermediate screens to the shooting screens, it's awesome. Everything is perfectly fluid. Moves of the players, screen scrollings and the ball animations are just perfect. 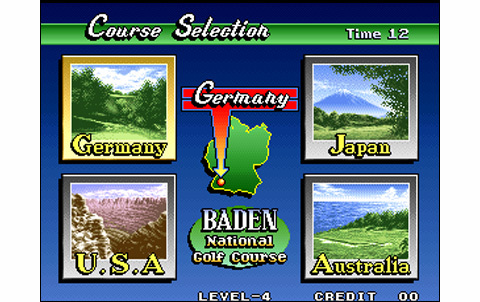 Four themes, four golf courses, featuring samples and effects which fit perfectly. It's musically a little repetitive throughout, but the quality is here, notably for sound effects. 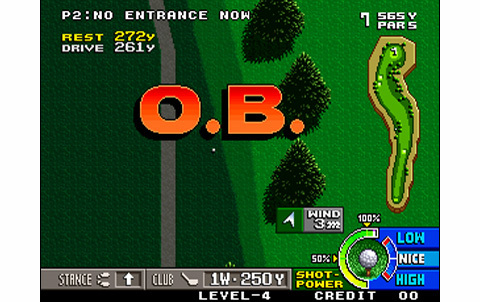 Players might come back often to Big Tournament Golf, with its varied courses and players: alone or with a friend, and it's always a pleasure. Very complete, featuring great sensations and very smooth controls. Room for improvement is great: pleasure when playing alone, fun when playing two: it's perfect. 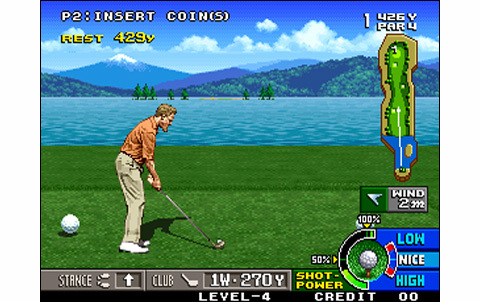 One of the best arcade golf games of all times, undoubtlessly. The game can't be found in AES. The last one sold on eBay went away for 1300 euros ... in less than 48 hours. It's easier to find converts around 150 euros, which is relatively more reasonable, and given the quality of the game, a pretty decent price.